The "Top Chef" champion often shares his love of cooking with his two daughters. Eating together as a family may be fun, but when it comes to actually getting the kids involved during meal prep, many parents can feel a bit overwhelmed. 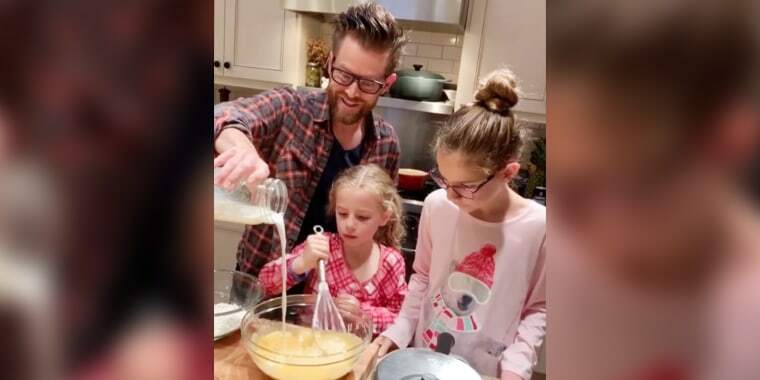 But for celebrity chef Richard Blais, turning his daughters, Riley, 10, and Embry, 7, into little sous chefs has been a rewarding experience. "When your kids are involved in the cooking process, they're going to like what they're eating just naturally," Blais told TODAY Food. "They love their own artwork. They love things they've made with their own hands. And as a parent, it makes it easier to get food prepared because you have a bunch of little helpers running around." The Food Network star recently partnered with Morton Salting Sous Chef (an Alexa Skill), and shared his top tips that any one can follow to help guide little hands around the kitchen. 1. Make a commitment to cooking. Blais says that in order to get young chefs excited about cooking, it's important for families to make the commitment to spend time working in the kitchen together. "Plan to wake up early on a Saturday or Sunday and cook breakfast together or make lunch together," said Blais. "Make a family commitment that you're going to do it together as a team." 2. Keep a close eye on little fingers. The chef recommends giving kids some basic lessons in cooking skills, and keeping a watchful eye on them to make sure everyone works safely in the kitchen. "Common sense is going to prevail," said Blais, adding that it's a good idea to provide small kids with step stools so they are able to stand safely above a cutting board. "As far as knives and stuff, you just want to be there with them. "There are little tips — like folding your fingertips in and also that you don't leave an exposed pinky or thumb over a vegetable while you're chopping." 3. Don't hover over them. "We should be concerned about kids' safety and we should monitor each and every step in the kitchen, but also realize that they're little people and they can do it," said Blaise. "I'm not saying throw them in a corner with a cutting board and tell them to take care of 50 pounds of carrots and onions, but give them the opportunity to do things in the kitchen and you'll be amazed by what they can actually do." 4. Clean up as you go. As a professional chef, Blais said he makes sure to clean while he's working in the kitchen. At home, his rules are no different. "Clean as you go," said Blais. "Incorporate the cleaning into the initial recipe itself. Once you start doing that, they see that the cleanup at the end isn't such a big deal because all throughout the recipe they've been rinsing off a whisk or cleaning out a mixing bowl." Today, Blais says his daughters have several meals they are able to make on their own, from start to finish. They enjoy making breakfast items like scrambled eggs and waffles. "We're building a database for them where they know a few things they can make by themselves," said Blais. "That comes in handy on a weekend when mommy and daddy need an extra 30 minutes of sleep."